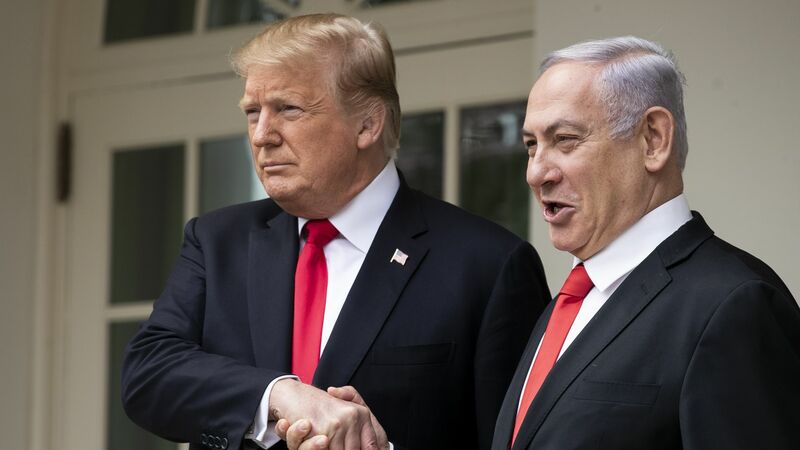 Trump calls Netanyahu's election victory "a good sign for peace"
President Trump told reporters Wednesday morning that Israeli Prime Minister Benjamin Netanyahu's election victory was "a good sign for peace." "Everybody said you can't have peace in the Middle East with Israel and the Palestinians. I think we have a chance. I think we have now a better chance with Bibi having won." Driving the news: Netanyahu scored a fifth term in office with his election win yesterday, declaring that he will be "prime minister for all" even as he faces a slew of corruption indictments. Trump called Netanyahu from Air Force One to congratulate him for his victory in the elections, Netanyahu's office said in a statement. Netanyahu thanked Trump for his support, and the two leaders agreed to continue working closely together. Earlier this morning, national security adviser John Bolton told Hugh Hewitt's radio show that now that the Israeli elections are over, the Trump administration will launch its highly anticipated peace plan in "the very near future." "We’ve been working, President Trump, Jared Kushner and others, for a couple of years now on a Middle East peace plan. We’ve been in the preparatory stages to getting it ready. And I think we’re going to see that coming out in the very near future. That opens all kinds of prospects. Then the struggle against Iran’s efforts to subvert peace and security in the region continues. And Netanyahu will play a big, big part in that, along with President Trump."